Safe Systems, Inc. (SSI) is an experienced installer of progressive home and business alarm systems. The primary function of which is to protect the lives and property of our customers. To this end, we are continually adding functionality to keep your home safe and intact. If you close your eyes and picture an alarm system, you might envision a panel with large buttons and perhaps a siren. Fortunately, alarm panels have advanced along with modern wireless technology trends. There was a time when your home security system was a separate, standalone piece of technology. Today, a contemporary alarm panel resembles a touch-screen tablet with a connection to applications on your mobile phone. With the right configurations, these systems can do much more than just a few years ago. Your security system won’t only help keep you safe, it gives you the convenience of having control over your home access, temperature, and energy efficiency at all times, even when you’re not there. 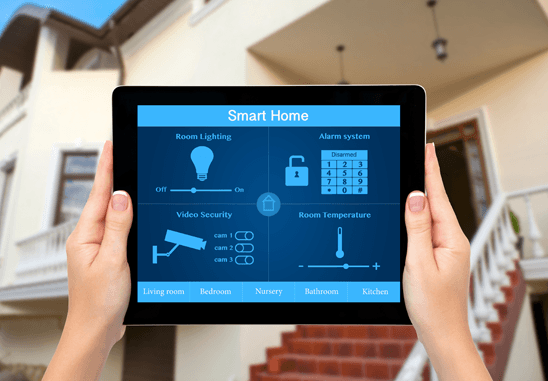 With the ability to connect your security, locks, video, lights, and thermostats, your home becomes pretty “smart” with convenient automation that you can control anywhere from your mobile device. Doorbell cameras provide a new level of protection for homeowners in a convenient new configuration. Whether you are on the second floor of your house or not even home at all, you can use your mobile device to see who is at the front door and allow or deny access to your home. SSI offers models with 1080p HD Video feeds including 5x zoom, accessible right from your mobile phone. The two-way voice and recording features are easy to use and add a new level of protection to your home. Video doorbells fit perfectly with smart locks. With both, you have advanced access control for your home. First identifying who is there and if they should have access to your property. The ability to lock and unlock your front door from virtually anywhere is at your fingertips. Anyone who has inadvertently locked themselves out or had to leave work to let someone in their home will appreciate this feature. SSI also specializes in camera systems strategically placed throughout your property. In many scenarios, additional video is used to examine more than what a doorbell camera can provide. Our system components are designed to complement each other and deliver the right level of protection. These devices can be viewed and controlled by a mobile device as well. With short days in the winter and long days in the summer, home automation from ADS can ensure you always come home to a well-lit house. If you are a frequent traveler, you will have the ability to set multiple lighting schemes with our security apps. Z-Wave modules make it easy to convert traditional lights into programmable devices. At the time of writing this article, it is 56 degrees outside; tomorrow the temperature is supposed to reach a high of 18 degrees. With such drastic temperature swings in the Midwest, it is essential to monitor the climate of your home. Temperature sensors throughout your home will help control the temperature in every room of your house. Comfort is excellent; energy efficiency is a significant plus. Our equipment can also detect dangerous conditions. Alarm sensors will detect a temperature beyond the normal thresholds. Unusual alarm keypad activity and surrounding sensors result in alerts sent to our Central Monitoring Station. Home comfort meets professional grade security to help detect issues such as a problem with your furnace, high humidity that could cause mold, an electrical fire, or extremely low temperatures that could freeze your pipes in winter. SSI can even detect when water accumulates. Even though you now have the technology to control and monitor your home from your mobile device, there may be cases where you are unable, such as work. No need to worry a central station operator also monitors your home security system 24/7. Our operators can help monitor the safety of your property and take action even when you can’t. Call 1.800.446.7519 to speak with an SSI consultant who can help you choose the right security solution for your property and budget.